Claim 1. The use of 17β-(N-tert-butylcarbamoyl)-4-aza-5-alpha-androst-1-ene-3-one for the preparation of a medicament for oral administration useful for the treatment of androgenic alopecia in a person and wherein the dosage amount is about 0.05 to 1.0 mg.
EP0776664: The application is deemed to be withdrawn. Claim 1. A method of treating male pattern baldness comprising orally administering to a male person_having a balding area 17.beta.-(N-tert-butylcarbamoyl)-4-aza-5.alpha.- androst-1-ene-3-one in a dosage amount from 0.05 to 3.0 mgs/day at least until growth of hair can be detected in the balding area by haircount analysis of the balding area. Claim 1. A method of treating female pattern baldness comprising orally ale person in need of such treatment the 5.alpha.-reductase 2 inhibitor 17.beta. 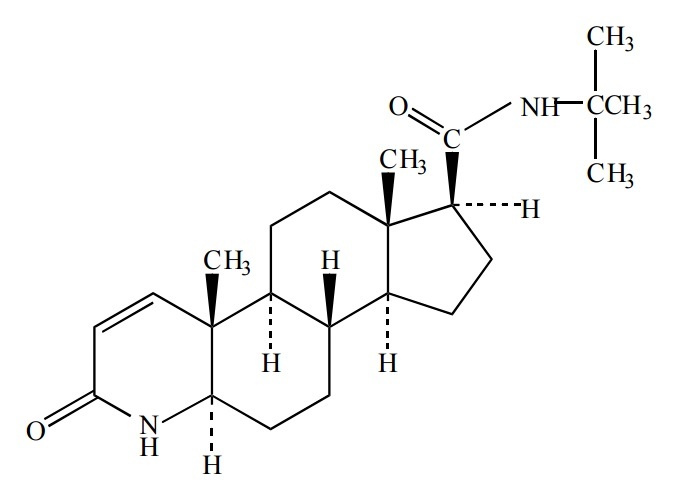 (N-tert.-butylcarbamoyl)-4-aza-5.alpha.-androst 1-ene-3-one in a dosage amount from 0.01 to 3 mgs/day. Claim 1. A tablet useful for the treatment of androgenic alopecia, consisting essentially of 17.beta.-(N-tert-butylcarbamoyl)-4-aza-5alpha-androst-1-ene-3-one as the active ingredient wherein the dosage is about 0.05 to 3.0 mg. Claim 1. A method of treating female hirsutism comprising orally administering to a female person in need of such treatment the 5.alpha.-reductase 2 inhibitor 17.beta.-(N-tert-butyl-carbamoyl)-4-aza-5.alpha.-androst-1-ene-3-one in a dosage amount of from about 0.01 to 3.0 mg/day.